The image of Jesus is a direct adaptation of this earlier, less complex picture. Up on the roof, there is a different, more ironic sort of veneration going on. Venice can can get overwhelming: the sun, the crowds, the art, the beauty…how much of stuff like this scene above can you take? Sometimes you just have to flee the city. Fortunately, The Lagoon beckons. 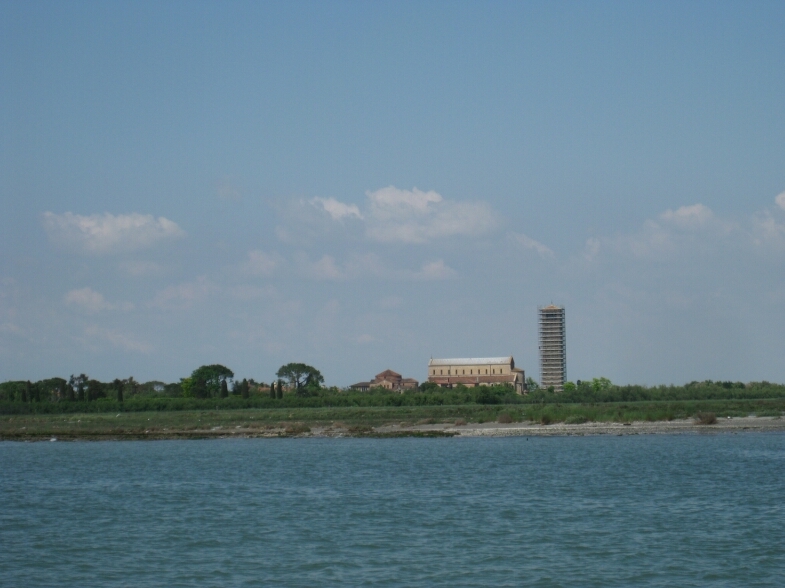 Within it, are several islands: Murano for the glass manufacturers; the cemetery; Burano, a small island community of brightly painted houses; and Torcello, about a thirty-minute boat ride a way. It’s a rather forlorn, marshy place, and practically no one lives there any longer, but it was the place where the people of the Veneto first sought refuge from the Hun invaders. It grew into a city, but poor resource management led to the silting of their lagoon, bringing mosquitos and malaria, and bad fishing. 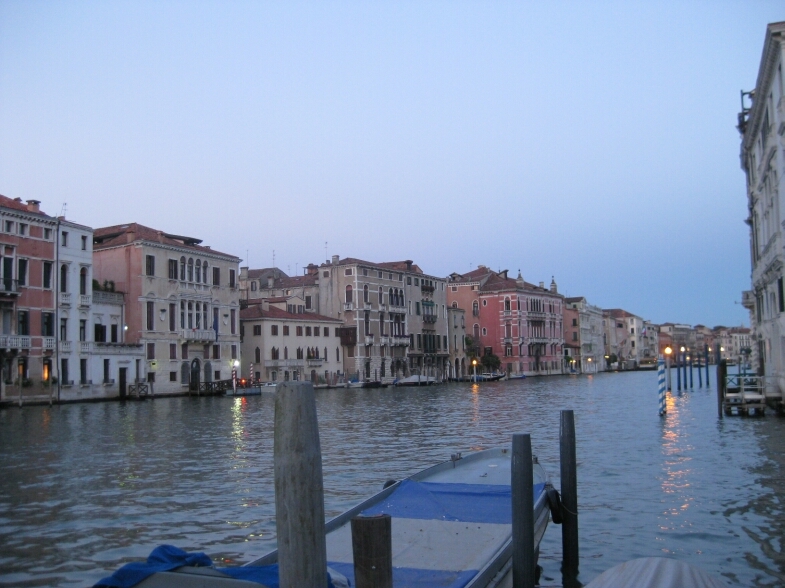 They up and left for what became the city of Venice. The citizens of the new city, practical to the core, looted Torcello for its stone, we would say recycled, so only a few buildings remain. 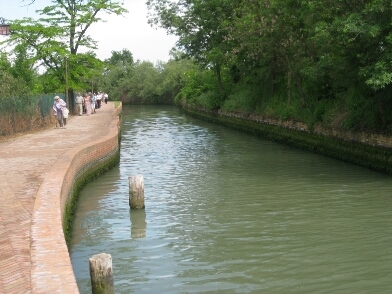 Not quite the Grand Canal of Venice, but at the end of the walk, there is a nice surprise. I am not talking about Cipriani’s, the tony restaurant outpost of the ‘famous’ Harry’s Bar that is right down the path from Santa Maria Assunta, but the mosaics inside that church, seen in the left of the photo below. 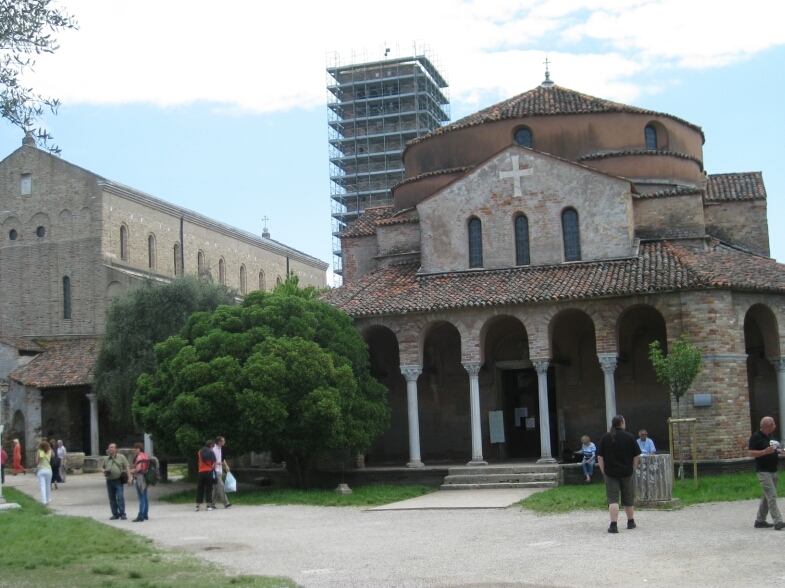 The structure on the right is the Fosca Basilica, and it is quite plain inside. The counter-façade of Santa Maria, i.e. 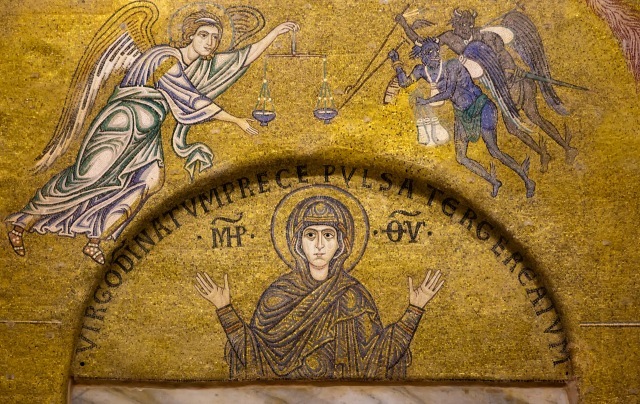 the wall inside of the main facade, is covered with a Byzantine-style mosaic of The Last Judgment that is incredible. (The photos are not mine.) 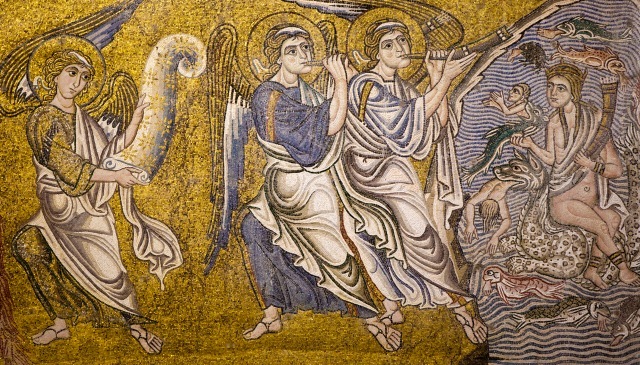 The one below shows the final trumpet raising some of the dead, including a few that met their ends in the jaws of large fish. 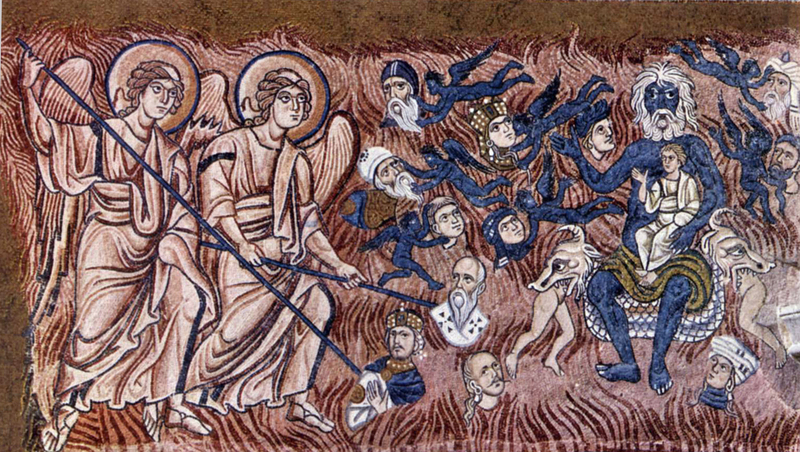 The dead do not have it easy in these scenes of judgment. Better make sure that you are on the right side of the scale used to weigh souls! And unto us a son is born. 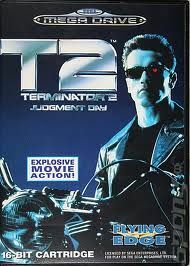 I was watching The Terminator 2 the other day since I’d never seen the whole thing. Also, I watched the first of the series a few weeks ago, and that finally made clear to me why Arnold was a villain first, then a good guy, or machine. 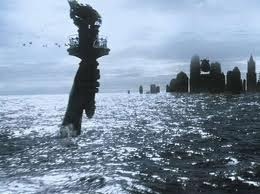 As science fiction, it is ordinary, but as an action film, I thought it was terrific. Of course, anything with a chase in the Los Angeles River gets my attention. I also thought it was an entertaining re-do of the Nativity story, and I’m always up for that. Some guy from the future comes back in time and impregnates an unwitting female, about as immaculate as you can get without actually doing it, because, you see, the father isn’t even born yet. And John, the boy, is born to save man from the machines after Judgment Day falls upon them as a nuclear Apocalypse brought on by their own sinful pride in their technology. John goes through a period of trials until he realizes his calling, in the desert of course. So, does this make the Terminator robot a stand-in for John the Baptist? He too gave his life for standing up to a prophet of evil. Augustine is thorough, and he’s determined to refute all the arguments he has encountered against his religious views. It can get pretty detailed. …So, the knotty question comes up about the Second Coming and the resurrection of the dead. We are talking about the virtuous, saved souls, who are bound for heaven. What size body will they get on their reawakening? If they died old, will they get their young body? What if they lost a limb or two in this vale of tears, our worldly life? Will it be reconnected to their body? And this…surely one of Augustine’s weirdest forays into the logic of miracles: What about those people who were victims of cannibals? 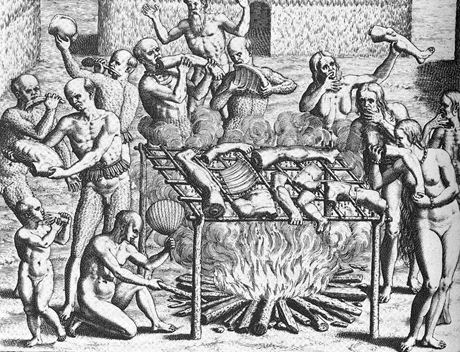 And that includes people who were eaten by others who may not have been pagans, e.g. during the travails of the sack of Rome by barbarians – some Christians may have taken this last resort to stay alive. Will the resurrected victim somehow get a reassembled body, even though his flesh has been consumed and incorporated into that of another? Yes, we are assured that the saved will be made whole. Nearing on the end of Augustine’s The City of God, I continue to be entertained by Saint A’s withering sarcasm towards his ‘opponents,’ i.e., the pagans, and his dogmatic torturing of ‘rationality.’ One man’s rational is another man’s fanaticism. Obviously, it’s all clear and simple which texts ‘we are obliged to believe.’ Following on, Augustine discusses many ‘marvels’ that are generally accepted as true, although they seem laughable to us. So, he argues, if you accept them, you might as well believe me too. Certainly, the miracles God performs are no more absurd than these ‘marvels.’ But, of course, he does believe in some of those marvels: He’s not just being funny. Marvelous things are abounding in the world, and, really, is a man rising from the dead so much more remarkable than some of the animals and natural wonders we come across? At one point, he cites the numerous volcanoes in Italy, mountains that burn continuously without being consumed! And, my goodness, Fire turns stones white, but turns wood black! And charcoal, which is created when fire consumes wood, cannot itself be destroyed by fire or earth! Thus, people put charcoal under stone property markers, knowing that it will never decay, so that if the stone markers are moved, they can prove the original location! What a weird manner of pre-scientific reasoning…Fire destroys, so there must be something magical about charcoal which will not be further destroyed. The salamander was thought to have the ability to live in fire – that’s strong!- and so become the symbol of the French kings. 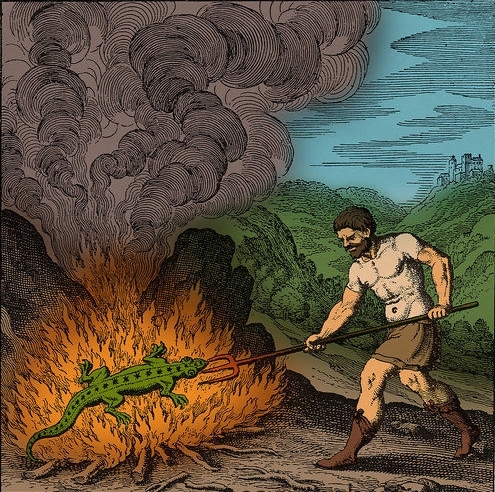 Later, the amphibian was shown as a fire-breather. 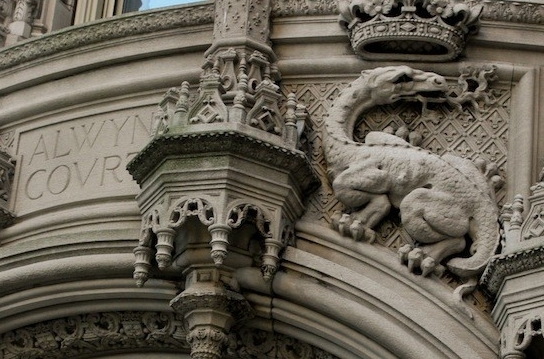 It shows up on several facades in New York City, most notably here on the Alwyn Court building, which is swarming with them.